China is on precautionary alert against possible radiation leaks from the deadliest earthquake to hit the country in three decades, according to a government website. The US secretary of state and her Indian counterpart Pranab Mukherjee discussed the current situation in Myanmar and the civil nuclear deal. The US authorities have pressed hate crime charges against an American teenager accused of setting fire to the “patka" of a Sikh student. The remark was promptly interpreted as a swipe at Democratic presidential candidate Senator Barack Obama who has emphasised the importance of dialogue with America's enemies. The remarks won applause in Jerusalem, but a sharp rebuke in Washington. Obama accused the president of trying “to launch a false political attack” against him. “I understand when you're running for office you sometimes think the world revolves around you - that is not always true and it is not true in this case,” Perino added. The other presidential candidates promptly weighed in. Senator John McCain, the Republican Party's presumptive nominee, said Obama was showing “naivety and inexperience and lack of judgment" in his willingness to meet with US foes. Obama has criticised McCain as being too close to Bush and by association a candidate who will usher in a “third term” of the Bush presidency should he win the election in November. Obama's Democratic rival, Senator Hillary Rodham Clinton, described Bush's original comments as "offensive and outrageous, especially in light of his failures in foreign policy." He was referring to Bush's former White House adviser. Kerry noted that Bush's own secretaries of state and defence had advocated talking to Iran. “If George Bush believes engagement with Iran is appeasement, the first thing he should do when he comes home is demand the resignation of his own Cabinet. Secretary [Robert] Gates and Secretary [Condoleezza] Rice have both favoured negotiations with Iran,” Kerry said. “The bottom line is that George Bush’s policies have made America less safe.... America needs - and Israel deserves - presidential leadership that actually makes us safer and stronger,” Kerry added. The disaster area is home to China's chief nuclear weapons research lab in Mianyang, as well as several secretive atomic sites, but no nuclear power stations. President Hu Jintao flew to Mianyang today, four days after the quake, which is thought to have killed more than 50,000 persons, state television and the official Xinhua news agency reported, in an indication the risk was low. Xinhua didn't say if Hu had inquired about nuclear facilities there. But nuclear scientists were evacuated from the area as a precaution, a source with knowledge of the evacuation said. "Everyone was evacuated. No one was left," the source, who requested anonymity, told Reuters. A Western expert with knowledge of the Mianyang lab had said it was unlikely it was at serious risk. A Chinese Foreign Ministry spokesman said this week he had not heard of damage to nuclear facilities in the disaster area when asked at a regular news briefing. Meanwhile, China struggled to bury its dead and help tens of thousands of injured and homeless today when a powerful aftershock brought new havoc four days after an earthquake thought to have killed more than 50,000. 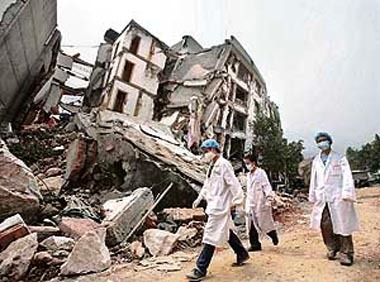 Premier Wen Jiabao said the quake damage could exceed the devastating 1976 tremor in the northeastern city of Tangshan that killed up to 300,000 people. Thousands of men, women and children were heading by foot for Mianyang, a city near the epicentre, saying they were abandoning their ruined villages for good. “On Burma, she yesterday spoke with Chinese Foreign Minister Yang. I mentioned Secretary General Ban Ki-moon. And she also spoke with Indian foreign minister Mukherjee. Of course, part of their discussion also was about the Indian civil nuclear deal, but they focused quite a bit on the issue of Burma,” spokesman at Foggy Bottom Sean McCormack said. However, the spokesman was reluctant to give details of the conversation on the civilian nuclear initiative. McCormack’s refusal to provide details on the Rice-Mukherjee conversation pertaining to the civilian nuclear deal has is being seen against the backdrop of a perception here that the Bush administration does not want the finer details of the deal to be discussed publicly in an apprehension that this could make a volatile issue even more complicated. The Bush administration is quite aware of the political compulsions in India and according to a media report is disinclined to have members of Congress discussing the responses to queries out in the open. “The US-India civilian nuclear deal is in ‘such desperate’ straits that the State Department has imposed unusually strict conditions on the answers it has provided to law makers, that it be kept secret even if the materials are not classified,” a report in The Washington Post said. Garrett Green, 18, pleaded not guilty to charges of aggravated assault, bias intimidation, arson and criminal mischief slapped on him. He was ordered by the Municipal Court Judge Gregory Williams to appear on May 21. The incident occurred on May 5 and Green was arrested immediately after the incident. Authorities had earlier charged him with arson and criminal mischief but pressed hate crime charges of bias intimidation and aggravated assault yesterday. Hightstown Police Chief James Eufemia said the two charges were added after the department completed its investigation. "The aggravated assault charge was added because the student was set afire and that there was intent to cause serious bodily injury. The bias intimidation was added because a patka, which is a Sikh religious symbol, was set afire," he was quoted as saying by the local media. The 16-year-old Sikh boy, whose family does not wish him to be identified, did not suffer any major injury. Some of his hair were reported burnt after his headgear was allegedly set on fire by a cigarette lighter during a fire drill while he was talking to a friend.